The most versatile Quilt box on the market, it can be used both winter and summer replacing your inner cover. In the winter you can check on your bees by simply lifting the cedar bag (included) and adding feed if needed. There is enough room to place a pollen patty between the quilt box and top deep. You can also feed sugar blocks through the screen in the quilt box. 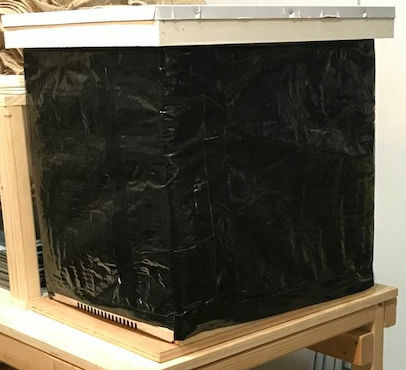 The quilt box come with a built-in top entrance giving bees easy access for cleansing flights on those warm winter days. 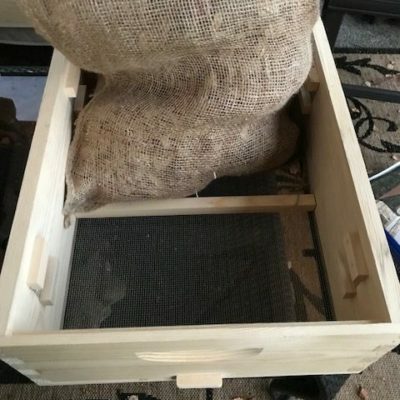 In the summer the cedar bag can be removed allowing additional ventilation and secure feeding in the hive using a quart or pint jar. This lightweight wrap fits a two deep hive. It is Ultra-violet treated with a R-Value of 3.7, so it is not just a windbreak, but it holds heat when it is cold out. Made to last for years, you cannot break it nor will it crack or deteriorate from exposure to sun, snow, ice or water. This wrap installs in seconds. Staple, tape, lath or tie onto your hive.